In Belsize Park, the hardest choice is whether to heat to the Heath or down to Primrose Hill at the weekend. Luckily the choice of where to send your fur covered friend during the week is rather more straightforward! With 16 acres of meadows and a whole range of purpose built facilities straight out of a dogs’ dream – all within 35 minutes of NW3… we’ve got you covered. We have a huge range of shapes, sizes and ages of dogs in our doggy daycare. We always make sure we match the activities to the individual dog- older dogs are able to take longer naps while the others bomb around the adventure playgrounds! We always make sure all of our dogs have a brilliant day, whatever their interests. Plus- our daycare is totally private and secure so all dogs can be off lead all day no matter how good (or bad!) their recall may be! 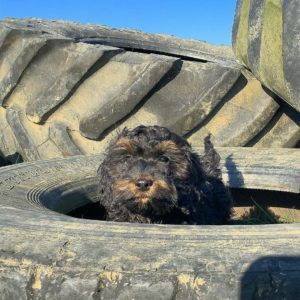 Our puppy daycare is simply the best way of socialising your puppy, ensuring they grow up to be happy and friendly around other dogs and people. We work with all sorts of breeds including dogs that would usually have the reputation of being snappy and nervous once older. Our puppy daycare helps pups grow up into friendly, playful adult dogs. We even have a separate playground for little paws to keep them safe away from the bigger breeds! Buddies are an absolutely fantastic daycare operation and I would recommend them to anyone. My wife and I have been sending our Cockapoo to them since she was a puppy and they have played a huge role in the happy and well-adjusted dog she has grown into. The team are hugely dedicated to creating a top notch experience for dogs and puppies in particular – they did such a good work on our dog’s recall that we barely had to work on it with her! They are also total lifesavers for us – we can go about our workday knowing that our dog will be collected and dropped back having had a fantastic (and tiring) day running around and socialising. And whenever we need to discuss any special requirements with them, they are an absolute pleasure to deal with – always enthusiastic and accommodating.